In the spring of 1864, Messrs. Ira G. Blake and P. S. Bartlett, both of whom were at the time connected with the Waltham Watch Company, paid a visit to Chicago. They became acquainted with J. C. Adams, then a watchmaker, and talked over the prospects of starting a watch factory in Chicago. Mr. Adams coincided with their views on the subject and interested several capitalists in the scheme. Messrs. Blake and Bartlett gave a glowing description of the Waltham Watch Company's business; they waxed eloquent, and at length convinced the capitalists that if Waltham could manufacture watches my machinery and supply the Western states, surely Chicago could make watches by machinery and supply the demand in the Eastern states. It was decided that the factory should be located at Elgin, and a tract of 35 acres of land was donated to the company for a factory site by the business men of that place. A three story frame building, 35x60 feet was erected on the water power and work begun on the watch tools and machines. D. G. Currier, a Waltham expert, was hired and together with Messrs. Moseley and Hunter, the work was started. April 25, 1865, the company was reorganized under a special charter with capital of $500,000. In the spring of that year work was commenced on the permanent factory, which consisted of a three story and basement, brick and stone building, 40x40 feet, with two wings 27 1/2x100 and 27 1/2x 86, respectively. Jan. 1, 1866, the machinery department was transferred to the new building. June 1st, of the same year the work of manufacturing watch materials was begun, but it was not until April 1, 1867, that the first movement was delivered form the factory. This movement was named B. W. Raymond, in honor of the president of the company. This movement was not, however, like the original model, but was an 18 size, key wind, full-plate, with a quick train and straight line escapement arranged to set on the face and was adjusted to temperature. It was a four hole, extra jeweled movement, and was a success from the very start. On July 16, 1867, a new watch was turned out which was named H. Z. Culver. The slow train was then adopted on all the new movements brought out and they appeared on the market as follows: J. T. Ryerson, Oct. 14, 1876 H. H. Taylor, Nov. 20, 1867 G. M. Wheeler, Nov. 26, 1867 Matthew Laflin, Jan. 4, 1868 Otis Hoyt left his home in Amesbury to go to work for the Waltham company in 1858. He severed his connection with the company at the time of the war, and served as captain until he was honorably discharged in July, 1864. In the fall of that year he joined forces with Geo. Hunter and several others and went to Elgin, contracting with the company for a term of five years. His health failed him, however, and in 1867 he was compelled to go to California for a change of climate, and from there he returned to Waltham. He soon went to Springfield, Ill., to act as superintendent, and remained in that position until 1871, when he went to Elgin to take charge of the train room, a position which he filled creditably for fourteen years. He died at his residence in Elgin, June 2, 1885. in his forty-eighth year. Mr. Benjamin W. Raymond, who was made president of the company after its organization, served until Oct. 10, 1867, when he was succeeded by T. M. Avery, who has since held the office. Mr. G. M. Wheeler, the secretary, was succeeded by Mr. Hiram Reynolds in January, 1868. January 28, 1869, the authorized capital of the company was increased to $2,000,000. May 20, 1869, the Lady Elgin made its appearance on the market. It was the first of the series of 10-size key wind, ladies movements, and proved very popular. It was followed by the Francis Rubie, which was adjusted to temperature, appearing August 24, 1870; the Gail Borden, September 8, 1871, and the Dexter Street, December 20, 1871. Mr. Benj. F. Lawrence, the vice president of the company, died December 16, 1871 and Mr. Geo. N. Culver was elected to fill the vacant chair. On June 28, 1873, the first stem movement was placed on the market. It was a Raymond movement made over, and was shortly followed by the Culver, Taylor, Wheeler, Laflin and Ogden. At a special meeting of the stockholders of the company held in Chicago May 12, 1874, it was decided to change the name of the company to "The Elgin National Watch Company." This was thought to be advisable because the movements manufactured by the company were universally known as and called "Elgin Watches". 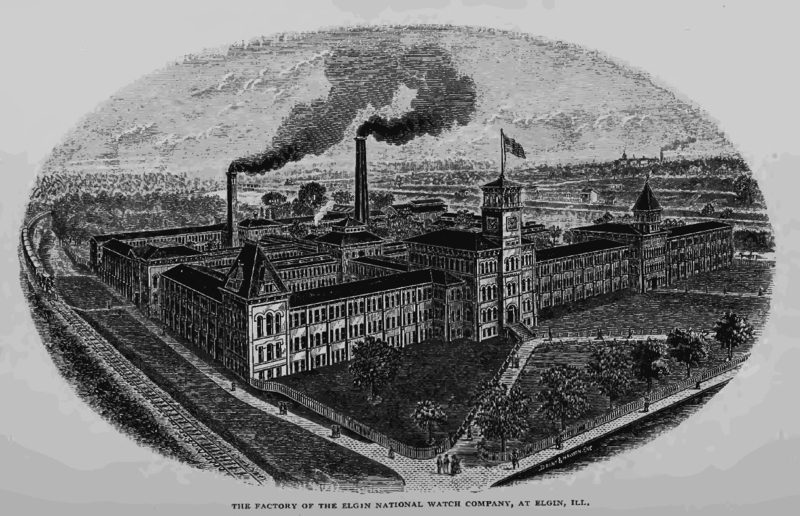 In March, 1875, the company began to make its own mainsprings, which had prior to that time been purchased ready made. June 16, 1875, the first watches called by the name of the company, were placed on the market and were designed by numbers. Seven new grades of 10 size, six grades of 12 size and five grades of 14 size, three-quarter plate, key wind movements, were made by the company between Sept. 29, 1875, and Dec. 29, 1876. Most of these new patterns were made for the foreign markets, which demanded movements differing in some respects from those made for home consumption. So large was the demand for Elgin movements during the year 1876, that the factory, although running over time, and turning out movements as fast as the capacity would admit of, yet the orders were far behind, and dealers were beginning to complain. The London office of the company closed, the forces increased, and everything possible was done to meet the enormous demand. In January, 1877, Mr. Hiram Reynolds, the Secretary, was succeeded by Mr. George R. Noyes. The company placed its first nickel movement upon the market, August 15, 1877. A new line of 8 size, stem wind movements were placed upon the market, June 11, 1878. In the fall of 1878 four grades of 16 size, three-quarter plate, stem-wind movement were brought out. These movements were interchangeable, in hunting and open face case, and were at the time considered quite a novelty. Mr. George R. Noyes, died in July 1879, leaving vacant the office of secretary, and Mr. Whitehead was elected and served until June 1884, when he was succeeded by Mr. William G. Prall. Henry H. Taylor died November 9, 1875 William H. Ferry, died March 26, 1880 J. T. Ryerson, died March 9, 1883 Benjamin W. Raymond, died April 5, 1883 Mr. George N. Culver filled the position of the Vice-President until June, 1884, when Mr. James W. Scoville was elected to that position. Upon the death of Otis Hoyt, foreman of the train room, in June 1885, this assistance, Mr. Geroge E. Farrington, was promoted to the position of foreman. For a number of years the mainsprings were made by Prenot of Philadelphia, but later on the company their own springs. The "Burt patent" to prevent accident in the case of mainspring breakage was the invention of Mr. Merritt Burt of Cleveland, Ohio, and modified by Mr. Chas. S. Moseley. The floor area of the present building is 169,000 square feet, not including the detached buildings, such as the gas house, 52X180 feet, the purifying house, 30X64 feet, the generating house, 60X118 feet, capenter shop, 30X135 feet, and engine house. From the above it will be seen that the company makes all its own gas, which is of a superior quality. The water is furnished by an artesian well and all know precautions against fire have been taken. The factory has its own steam fire engine, a trained fire brigade, one hundred dozen fire grenades, and a Holly system of water works, with a capacity of one inch streams. Two eight horse power engines proved the power for this mammoth institution. This account of the humble beginnings of the Elgin watch company is from The Watch Factories of America, Past and Present. 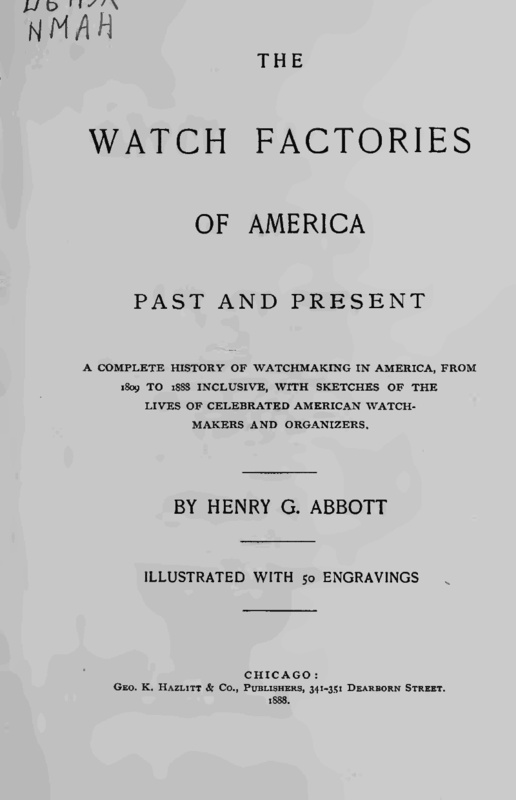 A complete history of watchmaking in America, Chicago, by George Henry Abbott, first published in 1888. Here we see the roles of the founders of the company and other significant figures, after whom Elgin named movements throughout its 100 years, G. M. Wheeler, and B. W. Raymond being the best known examples.